Delight your guests with these pretty plastic party picks for your hors d'oeuvre trays, or use them for fruit, veggies, cupcakes or fancy drinks at that special bridal shower celebration. The bridal shower snack picks come in an assortment of shapes and designs, including an engagement ring, wedding gown, bouquet of flowers, wedding cake and a heart that says “Love”. All the picks are flat and two sided. Length varies from 2 5/8" to 3". Add that special touch and turn an ordinary shower into an extraordinary shower! 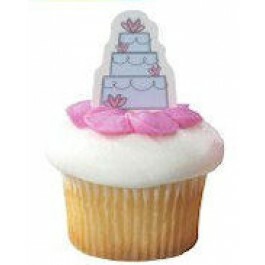 The reusable party picks come in packages of 12, (assorted only).